Helmed by Singaporean-Indonesian director Mike Wiluan, Grisse follows the harrowing rebellion undertaken by Indonesians under the brutal Dutch colonizers and corrupt governor in 18th century Gresik, East Java. Wiluan, who made his directorial debut early this year with the action movie Buffallo Boys, said he aimed to portray the violence that existed in history through Grisse. 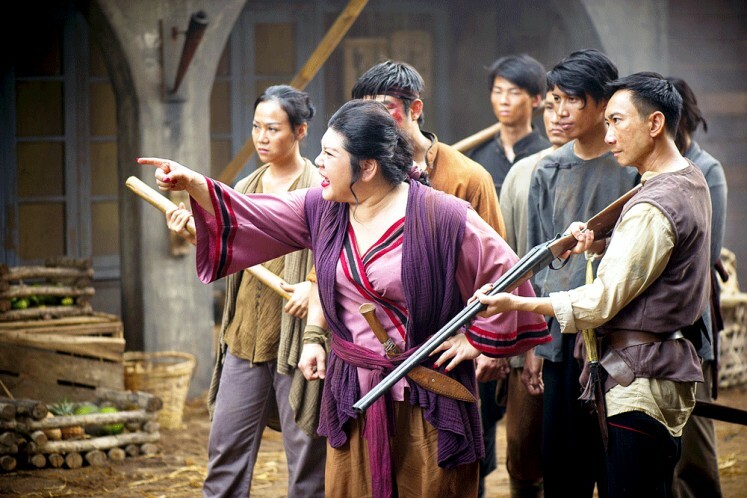 The eight-part saga is dubbed a “nasi goreng Western” given its Wild West style and intense fight scenes. This cinematic approach provided an interesting challenge to the actors who not only had to show their acting chops, but their fighting skills as well. Indonesian actress Adinia Wirasti takes the main role as grudge-filled revolutionary Kalia who acts as a catalyst for the Gresik rebellion against the oppressive, trigger-happy Dutch colonizers. As the tough swift-thinking rebel with a smooth emotional center, Kalia exudes a charm and fierceness that is confirmed the moment she glares at the camera. Adinia enjoyed the eight-week shoot in Batam, Riau Islands, which she described to be akin to a “bunch of children playing shoot-‘em-up with pretend guns”. Marthino Lio is the male lead, fellow rebel Maran, while other Indonesian actors such as Jamie Aditya, Zack Lee, Ully Triani and Kelly Tandiono were cast in supporting roles. The Indonesian cast shared the screen with a number of foreign actors, including Japan’s Toshiji Takeshima and Malaysia’s Joanne Kam, as well as Jimmy Tanaka and Hossan Leong from Singapore. The first two episodes of Grisse have been aired on HBO, with six more left to go. While the story is at first held back by the rather slow pace of the first episode, the next episode reveals the intense action and plot, which seems to only improve as the series goes on. Grisse also sees the return of actress Alexandra Gottardo to the small screen after quitting the soap opera scene in the early 2000s to pursue a movie career. She has a supporting role as Harsha the sidekick of Zack Lee’s opium den-owning character Jambu. She describes her character as worlds apart from her previous film roles, such as the 2016 chick flick Pinky Promise and the recent conservative Muslim drama Hanum & Rangga. Alexandra says the action-packed scenes gave her a chance to enhance her acting skills and to showcase her prowess in silat martial arts, which she learned at a young age. Alexandra suffered a minor injury during filming but it did not hold her back from giving her best. “Those things happen in this type of situation. As an actor, I can only play my role the best way I can,” she added. Its Western touch and fictional characters aside, Grisse contains some true historical accounts about Gresik under Dutch occupation. During research for the series, showrunner Wiluan found out about the grand plans that were envisioned by the Dutch to develop Gresik, such as the building of a fort and the plan to make it into a major port city due to its proximity to Surabaya. Those lost opportunities, he said, made him to think about what affected the decisions of the Dutch and whether or not the occupants of Gresik today would have benefitted from the original plans.